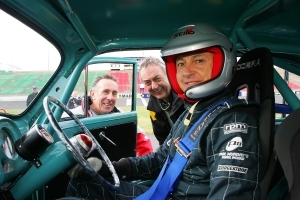 Following a first shakedown at Calder Park this week, racing legend Peter Brock says he is highly impressed with a racing-modified version of Holden’s first car, the 48-215, which he will drive at the Goodwood Festival of Speed in September. The 1953 Holden, dubbed the “FX” model, has come together under the expert eye of Kilsyth panel beater and early-model Holden enthusiast Phil Munday and former Holden Dealer Team engine builder Ian Tate. The Calder Park shakedown this week will be followed by more testing at the Phillip Island grand prix circuit, prior to the car’s departure for the UK next month. “We built a bodyshell as stiff as the regulations would allow it and then Ian Tate took a stock ‘Grey Motor’ and built an engine that’s about as good as an (Torana) XU-1,” Brock said. Tate said dyno cell testing of the modified engine revealed an output of approximately 188hp – comparable to a Torana XU-1 and three times the output of a stock Grey Motor – and an estimated top speed of 210km/h. 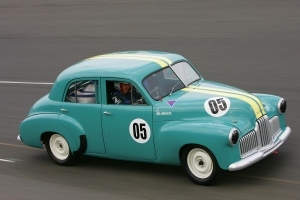 Munday said the process of building a racing version of Holden’s first car had been challenging, in attempting to keep the car as “stock” as possible. “No one has ever built one of these before, in the sense of putting modern-day specs into such an old car,” he said. “But we’ve kept the steering column and linkages, the diff, the springs, that’s all stock FX 48-215 gear. We had to add a couple of things to bring it up to Goodwood specifications, such as a Muncie 4-speed gearbox and disc brakes. Brock agreed the lack of a blueprint meant that the team had to turn their thinking to the nearest example they were familiar with – the Torana XU-1, a car in which Brock won the 1972 Bathurst 1000. “None of us have had much experience with the 48-215. I began my career with the HK Monaro and later the Torana XU-1, so there’s a bit of ‘Torana thinking’ in the car,” he said. Brock will race the car in the Revival Historic Circuit Race Event at Goodwood against other classic marques including Mk.1 Jaguars, Zephyrs and Austin A30s. In his first trip to Goodwood last year, Brock drove in the Hill Climb section of the event in another milestone Australian car, the 1984 “Big Banger” VK Commodore in which he and Larry Perkins won the 1984 Bathurst 1000. “Anyone who goes across to Goodwood will tell you it’s one of the greatest motor racing events you will ever go to and that they can’t wait to get back there again,” he said. “It’s damn good racing, some very interesting people and amazing machinery there. “They asked me last year if I could bring back the car I started racing in, which was an Austin A30 with Holden mechanicals. But the car they wanted was a long, long way outside their regulations, so I asked them about a 48-series Holden. They said ‘what’s that?’ I told them that it was where it all started over here.